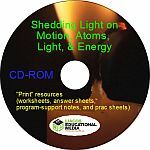 The Shedding Light on Energy series allows teachers to teach the topic of Energy without actually using much energy! 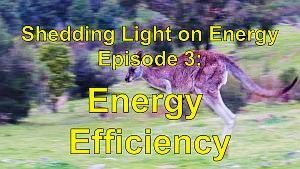 With a perfect mix of biology, chemistry, and physics, we explore every aspect of energy including what it is and how we measure it. 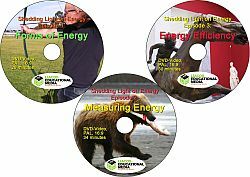 In Episode 1, Forms of Energy, we introduce students to the different types of energy that affect their lives daily and describe how energy can change from one form to another. We also explore one of the most important discoveries ever made. Forms of Energy Question Sheet. Part A: Introduction. Energy is basically what gives things the ability to change in some way. Part B: The Many Different Forms of Energy: Energy comes in a variety of forms; for example, electrical energy and light energy. Things can store energy and the energy can then be released when needed. 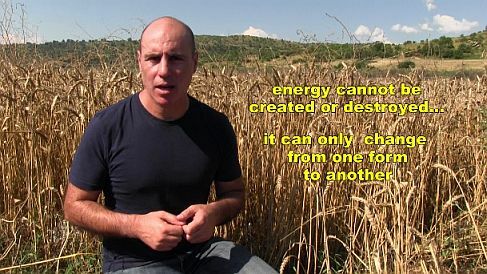 Part C: Energy Transformations: Energy cannot be created or destroyed! However, it does change from one form to another, and we will show you lots of examples. 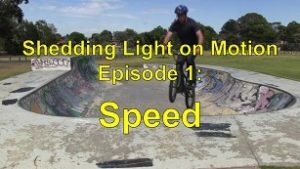 In this series, we’re going to look at Energy. Energy, at a really basic level, is what gives things the ability to change in some way. When a boat moves across the water it’s changing its location. Energy is needed to make this change happen. Movement requires energy. When you cook food, the temperature of the food changes and so does its chemical composition. Energy is also required to make these changes happen. When you pull on a bow, the shape of the bow changes, and, you guessed it, energy is required to make this change as well. When something has energy, it can make things change. Energy is actually really hard to define, to put into words that say exactly what it is, so for convenience, we normally simply describe energy as coming in different forms. 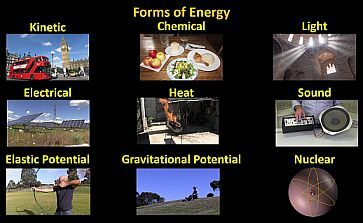 These forms of energy include light energy, electrical energy, chemical energy, sound energy, heat energy, nuclear energy, elastic potential energy, gravitational potential energy, and kinetic energy. These different forms of energy are all constantly changing from one form to another and they’re constantly transferring from one thing to another. 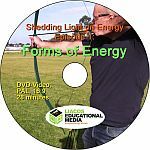 In this lesson, we’re going to take a look at these common forms of energy and we’re going to examine situations where energy transforms from one form to another. So let’s begin. 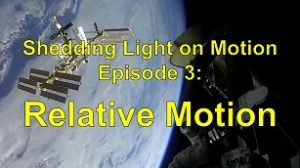 If something is moving, it is said to have “Kinetic” Energy. The word kinetic comes from the Greek word kinesis, which just means movement. 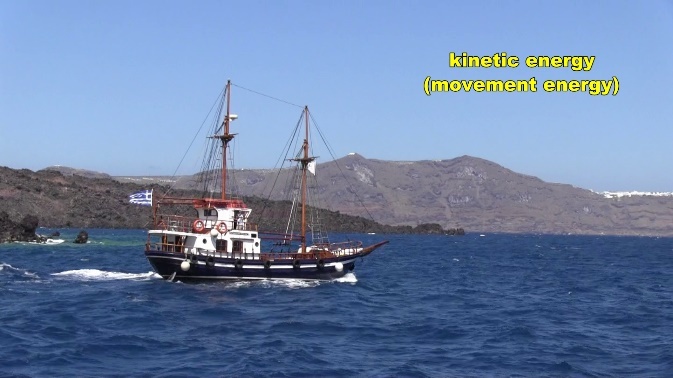 So kinetic energy is movement energy. 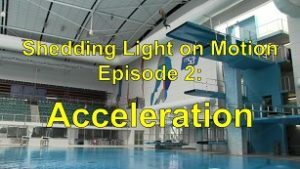 Anything that’s moving has kinetic energy and that kinetic energy can be put to good use. A moving bus has kinetic energy. 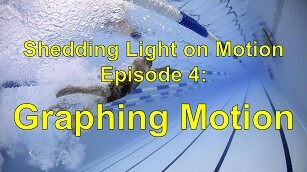 A moving boat has kinetic energy. A plane taking off, a bird flying in the air, a person running, everything that is moving has kinetic energy. But where do all these things get their kinetic energy from? Well, the energy comes from the fuel that they use. All fuels have what we call chemical energy. This piece of wood doesn’t look like it’s got much energy. 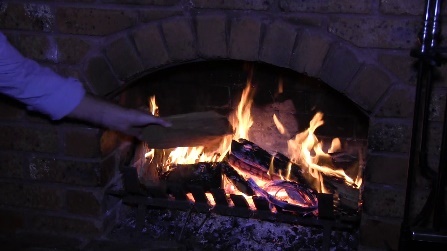 It’s not really moving and it’s not really hot or anything and yet, when wood burns the energy that it has, the chemical energy that it has stored inside the chemicals that make it up gets released in the form of heat energy and light energy which are two types of energy that we’ll look at in more detail soon. 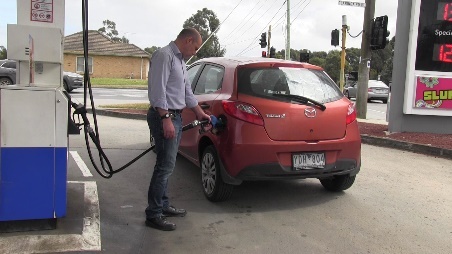 The fuel we put into our cars also has chemical energy. In the engine, the fuel is burned, and the chemical energy that is stored in the fuel is released and the car gains kinetic energy when it speeds up. 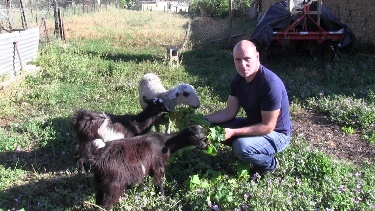 Animals get the energy that they need from the food they eat. Most foods contain a combination of these essential nutrients, but it’s the carbohydrates and the fats and oils that have chemical energy stored in them, chemical energy that our bodies need. 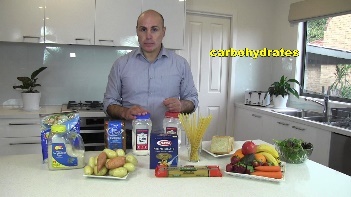 Carbohydrates, probably our main source of energy, are contained in, for example, rice, corn, potatoes, foods made of wheat flour, such as bread and pasta, and fruits and vegetables. There are actually many different types of carbohydrates. The simplest types are simple sugars called monosaccharides and they include glucose, fructose and galactose. In their pure form, they are all, like the pure glucose you can see, white powders, and they all taste sweet. The first two are typically made by and found in fruits and vegetables while galactose is made by mammals like cows and is found in milk. Monosaccharides are all made of carbon, oxygen, and hydrogen atoms arranged in slightly different ways. Since their chemical structure is a little complicated, I’m going to represent each of them with a simple oval shape. 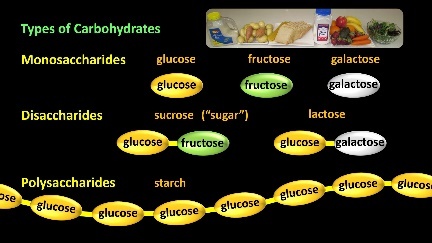 Monosaccharides (mono means “one” by the way) are the building blocks of other carbohydrates. Disaccharides are sugars that are formed when two monosaccharides are joined together (di means two). For example, sucrose, what we typically call sugar or table sugar, the sugar we put in coffee for example, is made of a glucose and a fructose stuck together. Sucrose is commonly found in fruit but most of the sucrose in our diets (in biscuits and cakes and things) comes from sugar cane. Lactose is formed when a galactose and a glucose are joined together. Lactose is found in milk. Remember all monosaccharides and disaccharides are sweet and all are classed scientifically as types of sugar, even though when most people say sugar they are typically only referring to sucrose. We then have polysaccharides like starch. Poly means many. Starch is not sweet and is not classed as a sugar. 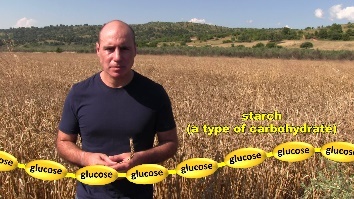 Plants like wheat make starch by joining large numbers of glucose molecules together, and so wheat or more specifically the flour that we get from it, is rich in carbohydrates. It’s actually fairly easy to extract the flour from the wheat. If I rub the so-called head of the wheat plant, the dryish, edible seeds called kernels separate from the rest of the head fairly easily. After removing the seeds from the outer husks and then getting rid of the husks, I’m left with the edible kernels which I can then start to grind down. 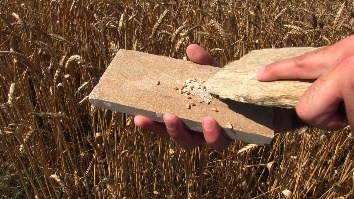 This process is called milling. You can see the white flour coming out of each kernel. It’s this flour that is one of the most important sources of chemical energy in the world. Of course it’s not extracted by hand. The wheat is harvested by machines and transported to huge mills where other machines do the crushing and the separating. 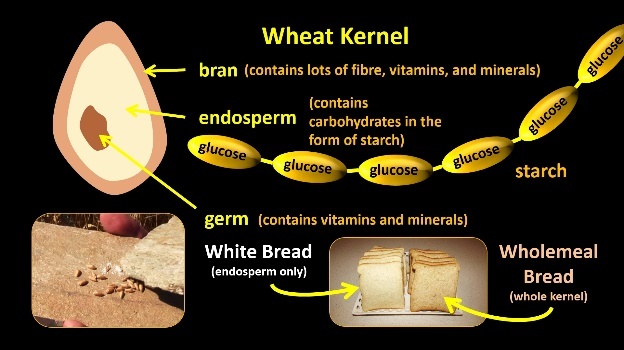 The wheat kernel is made of the bran, the outer layer that contains lots of fibre, vitamins and minerals, the white endosperm, which is the part that has the carbohydrates in the form of starch and a bit of protein, and the germ, which also contains vitamins and minerals. White bread is made from white flour which contains only the white endosperm, but wholemeal bread is made from wholemeal flour that also contains the crushed up bran and germ, so it gives you the energy you need and more fibre, vitamins, and minerals. So, what happens when we eat foods made of flour… or rice, potatoes and other foods that have carbohydrates in the form of starch in them? Well, the glucoses that make up the starch are all separated from each other by the digestive juices in our saliva, in our stomach, and in our small intestine. This process of breaking food down into smaller units is called digestion. 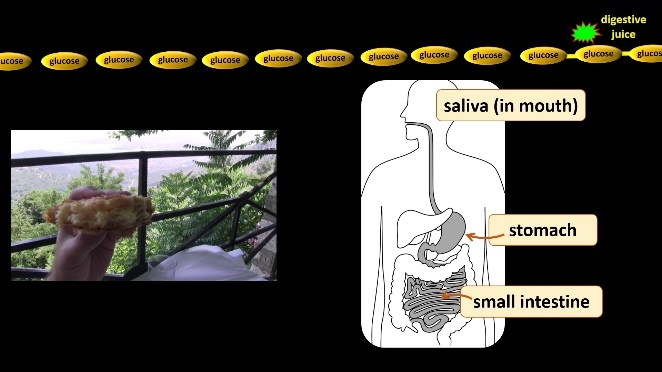 After digestion, the individual glucoses then enter the blood mostly from the small intestine and are delivered to our cells. The process of using the chemical energy stored in glucose to power our bodies is called “cellular respiration”. It’s a pretty complicated process, but basically glucose chemically reacts with oxygen in our cells (the oxygen comes from the air we breathe in), and produces carbon dioxide and water. This releases the stored chemical energy in the glucose, and our cells use the energy to do what they do (like make proteins and other chemicals that we need and make muscles move and send signals and so on). Now while carbohydrates are probably our main source of energy, we also get a lot of our energy from fats and oils. Fats and oils are present in meat but also in certain fruits and vegetables. Olive oil comes from olives of course. 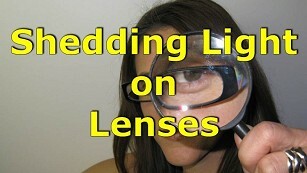 They too are digested, that is broken down into smaller molecules when we eat them. 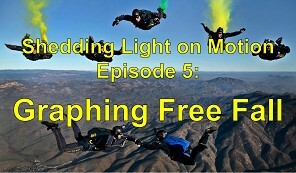 Another type of energy is light energy. 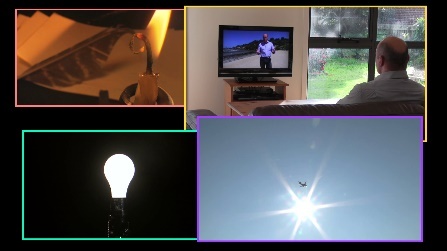 Fire, TV screens, light globes, and the sun, all produce light energy. 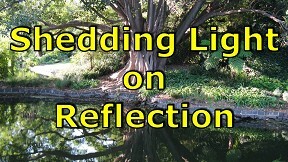 Light energy can also, like every other form of energy, make things change. 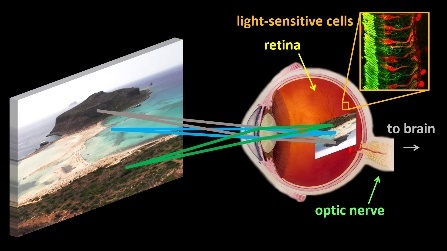 When, for example, light coming from an object enters our eyes, the light energy that it carries is absorbed by certain chemicals in the tiny, tiny, light-sensitive cells on the retina at the back of our eyes. The way the atoms are arranged in the chemicals actually changes. This causes a signal to be sent off via the optic nerve to the brain and the brain recognises what we’re seeing, in this case a beautiful beach scene. Without the light energy that comes from the sun, life on Earth just wouldn’t be possible, but we’ll look at why in the next part of this video. 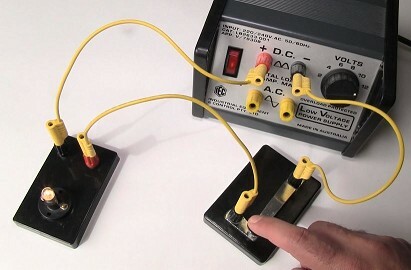 Electrical energy is the energy that is carried by electricity. But what is electricity? Well, as you probably know, everything is made of atoms. 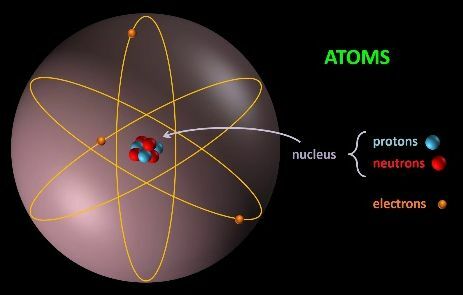 Atoms themselves are made up of even smaller particles called protons and neutrons which together make up the central so-called nucleus of the atom, and electrons, which spin around the nucleus really fast. 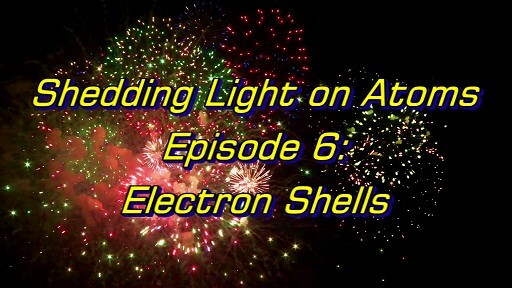 In metals, the electrons can actually move from atom to another when, for example a battery is connected to a light globe with wires. The energy that the electrons have as they’re forced to move around the wire by the chemicals in the battery is called “electrical energy” and it can be used to do all sorts of things. Light globes, TVs, electric motors, trams, and trains for example all need electrical energy to operate. Electric heaters like this one also need electricity to operate. Heaters produce what we call heat energy. Heat energy is the energy that transfers from a hot object to a cold object, which results in the cold object getting hotter. Controlling heat energy is hugely important of course in cooking, but it’s also important in maintaining our body temperature, regardless of where we are and what we’re doing, at a constant 37°C, in keeping our homes warm and in a huge range of industrial processes like the production of plastics and fertilizers. 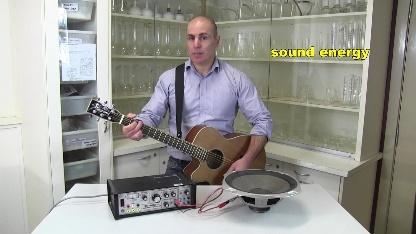 Sound energy is the energy produced by anything that makes noise. It’s caused by vibrations. For example, guitar strings vibrate and produce sound. Our vocal cords inside our throats also vibrate and produce sound. This is what our vocal cords look like. 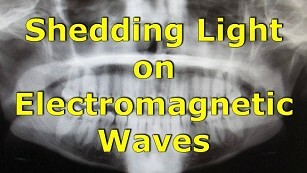 The video was taken by a doctor with a mini camera attached to a tube that was lowered down the patient’s throat. 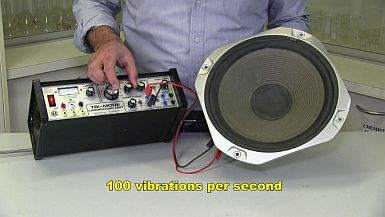 This speaker, which is connected to an electronic “signal generator” is moving backwards and forwards once per second. Since it’s moving really slowly it’s not making any noise that we can hear. If I increase the number of vibrations per second it eventually starts making sounds that we can hear. At 100 vibrations per second it sounds like this, and at 200 vibrations per second it produces this sound, which has what we call a higher pitch. Lower pitch, higher pitch. The vibrating speaker causes the air around it to vibrate and these vibrations move out through the air in a sound wave, much like a wave travels through a slinky. Now you might think that things that are really loud, like the speakers they use at concerts, would produce huge amounts of sound energy. But, in fact, the amount of sound energy produced even by very loud things is actually very small. 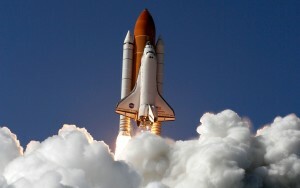 The sound energy produced by a jet taking off, for example, is a tiny fraction of 1% of the total amount of heat and kinetic energy that it’s producing. However, it can be enough to cause hearing loss if you stand underneath it because our ears are very sensitive. 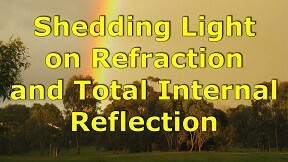 Let’s look at another form of energy. 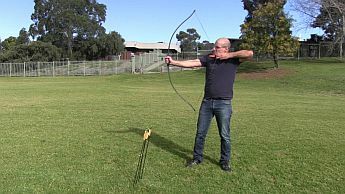 If I pull on the string of this bow, the energy that my muscles provide to stretch the bow and the string gets stored in the bow and the string. Energy that is stored in something that has been stretched is called elastic potential energy. Once I’ve stretched the bow, it doesn’t look like there’s any energy here. Nothing’s moving for example, it’s not hot, it’s not giving off any light, but the elastic potential energy that is definitely stored in the bow becomes obvious when I fire the arrow and it moves off with kinetic energy. A stretched or compressed spring also stores elastic potential energy. This toy gun, which the manufacturers call a fly gun, has a spring in it and if I compress the spring, I store elastic potential energy in it. When I release the spring, the elastic potential energy transforms into kinetic energy and it pushes on the swatter which flies out a high speed, killing the fly if you’re accurate enough. 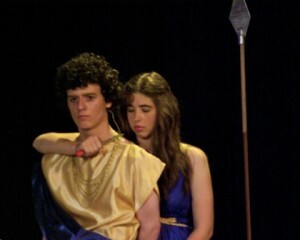 There were no flies around unfortunately when we shot this scene. Closely related to elastic potential energy, is gravitational potential energy. Gravity is the invisible force that tries to pull everything downwards. It’s kind of like an invisible spring that’s attached between the Earth and everything on it. When you lift something up, and that includes your own body, you have to apply a force on it and give it energy. Gravitational Potential Energy is what we call the energy that is stored in something that is up high. 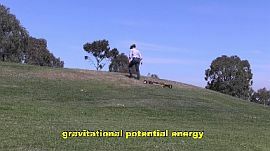 Here I’m lifting myself and the billy cart upwards against gravity and at the top of the hill, I and the billy cart, have gravitational potential energy. 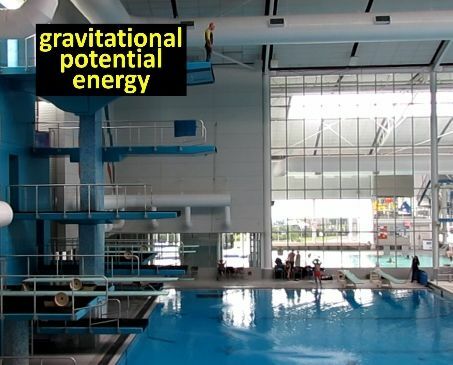 Something that has been lifted up 5 metres has more gravitational potential energy stored in it than something that has been lifted up only 1 metre. The higher something is, the more gravitational potential energy it has. Once again, something up high might not seem to have any energy, but the gravitational potential energy becomes obvious when the object is allowed to fall back down or to roll back down. The gravitational potential energy actually transforms into kinetic energy. So, standing here 10 m above the water, I’ve got gravitational potential energy but no kinetic energy. When I jump off, my gravitational potential energy decreases, and my kinetic energy increases as I accelerate downwards. 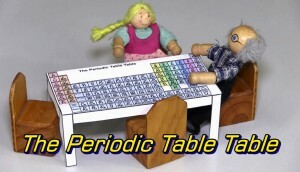 And finally, nuclear energy is the energy that is stored inside the nucleuses of atoms. 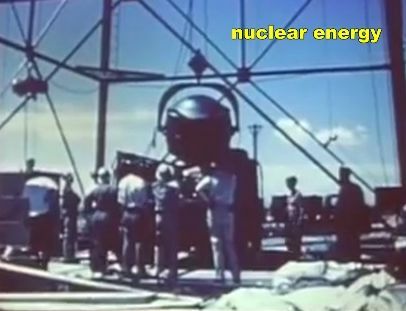 This is footage of the first nuclear bomb about to undergo a test in New Mexico in the USA in 1945. 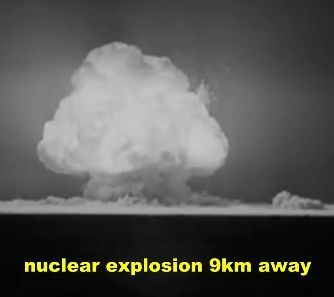 This footage, taken from about 9 kilometres away, shows the actual nuclear explosion. Up until then, it was the most powerful bomb ever. Ordinary bombs use explosives that have a lot of chemical energy in them, but a nuclear bomb’s energy comes from nuclear energy. As we saw a little earlier, atoms have a nucleus made of protons and neutrons. Every nucleus has nuclear energy holding the nucleus together and this energy normally stays within the nucleus. However, under certain circumstances the nuclear energy can be released in the form of heat energy, light energy, and kinetic energy. That’s actually a real ship there that was used for this nuclear-bomb test. The ship had been decommissioned, that is retired from service. 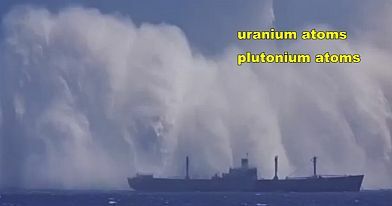 Nuclear bombs use the nuclear energy of uranium atoms and plutonium atoms to cause massive destruction. Nuclear power plants also use the nuclear energy of uranium atoms and plutonium atoms to produce a steady amount of heat which is used to generate electricity. Now remember, the thing is not the same as the energy that the thing has. A (stretched slingshot?) stretched bow is a stretched bow, but it possesses, it has stored in it, elastic potential energy. A biscuit is a biscuit, but it has chemical energy in it. A car is a car but it has kinetic energy when it’s moving. 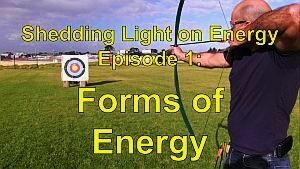 Now I mentioned earlier that energy is always transforming from one form to another, and I’ve given a few examples, but we now need to look at this concept in a little more detail. There’s a really important law in Physics called the First Law of Thermodynamics that says that energy cannot be created or destroyed but that it can only change from one form to another. So, everything you see on Earth that has energy, received its energy from something else. 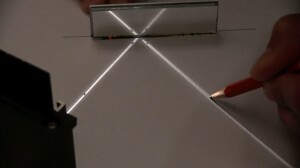 For example, a light globe produces light energy, but it gets this energy from electrical energy. 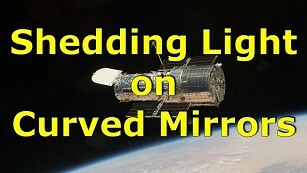 In a light globe electrical energy is transformed into light energy. We can represent this information in a simple graphical way using an arrow. (electrical energy –> light energy) Heat energy is also produced, but it’s not the type of energy that we want from a light globe. A battery can produce electrical energy but where does its energy come from? It comes from the chemicals in the battery which have chemical energy stored in them. Our bodies and those of all animals convert the chemical energy that is stored in the food that we eat into kinetic energy. Food is our energy source. Once again, we can represent this information in a simple graphical way. 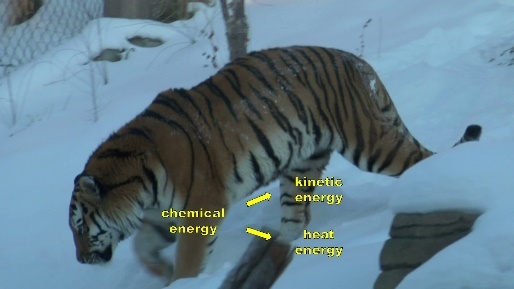 Chemical energy transforms into kinetic energy. However in humans and other mammals, a lot of the energy is also converted to heat energy so that our bodies maintain a temperature of about 37°C, even in very cold conditions. The chemical energy in our food is actually transformed into kinetic energy and heat energy. But where does the chemical energy in our food come from? Well, let’s take one example: bread. Bread is made from flour, which comes from wheat. 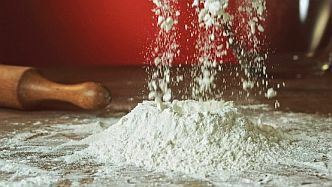 As we’ve seen, flour is rich in what are called carbohydrates and carbohydrates possess chemical energy. 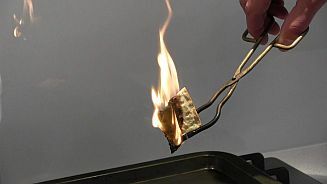 Here the chemical energy stored in the flour that this dry biscuit is made of is being transformed into heat energy and light energy as the biscuit burns. In fact all foods burn, as long as they’re dry enough of course, because they’ve all got chemical energy. In our bodies, the stored chemical energy undergoes a more complex process than simple burning, but basically the chemical energy of the carbohydrates transforms mainly into heat energy and kinetic energy. But where does the wheat plant get the energy to produce carbohydrates? Well, it gets the energy from the sun. 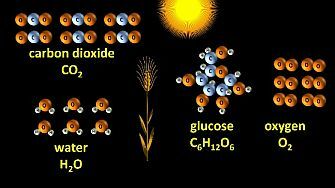 Carbohydrates are made by plants from two simple ingredients: carbon dioxide molecules and water molecules. A molecule is a small group of atoms that have bonded together. The wheat plant and in fact most plants absorb the water molecules through their roots and absorb the carbon dioxide molecules through their leaves. Carbon dioxide gas makes up about 0.04% of our atmosphere, by the way. Using the energy of the sun, the cells of the plant use the carbon dioxide and water molecules as raw ingredients to assemble glucose molecules. Oxygen is also produced. The plant actually needs 6 CO2 molecules and 6 H2O molecules to make each glucose molecule, and 6 oxygen molecules are produced. The chemical equation can be written as carbon dioxide + water produces glucose + oxygen. The glucose is a store of chemical energy. Light energy from the sun is transformed into chemical energy which is stored in the glucose. So, the glucose molecule is not just a collection of atoms that the plant puts together. The atoms of the glucose molecule are arranged in a way that there is energy stored in the chemical bonds that hold the atoms in place. We can liken it to a mouse trap. 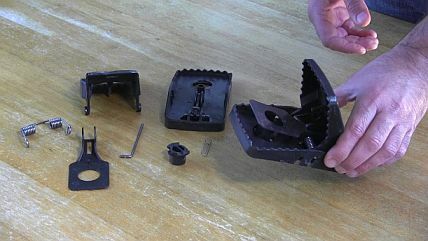 The parts of a mouse trap are pretty useless on their own, but when they are assembled AND set, they have energy stored in them. When oxygen atoms come along, the energy that is stored can be released. Here I’ve rested a second ball on the mouse trap. The energy that was stored is probably even more obvious now. In fact, chemical energy is very, very similar to elastic potential energy. Photosynthesis is the name given to the process by which plants use the energy of the sun to make glucose, which as I said, is a store of chemical energy, chemical energy that was transformed from the light energy coming from the sun. Plants use glucose for their own energy needs and they use it to produce other molecules that the plant needs, including, in the wheat plant, the starch that makes up a significant amount of flour. Orange trees don’t produce starch, just sugars: oranges contain glucose, fructose, and sucrose, and that’s why they’re sweet. Each year, millions are grown in orchards around the world before being picked and sent off to markets. Without light energy, plants can’t grow. 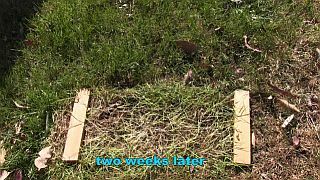 If I cover some grass with a piece of wood, which stops light getting to it, we can clearly see that two weeks later it is suffering. Air could get to it, since the wood was elevated, and I occasionally watered it. 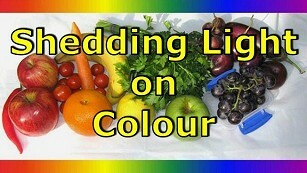 But plants don’t just need air and water, they also need light to photosynthesise. 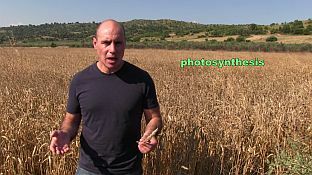 Of course, when wheat is ready to harvest, there’s probably not a whole lot of photosynthesis happening, because the wheat plant is drying out. Most of the photosynthesis occurs while the plant is still green. 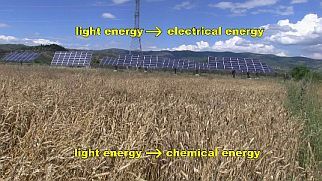 So we get our energy from the chemical energy in the food we eat and plants get their energy from the light energy in sunlight. 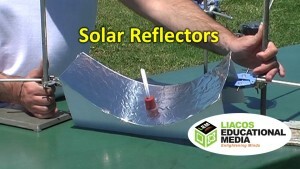 If I shine light onto this solar panel (or solar cell), it produces electricity and the LED then transforms the electrical energy back into light energy. 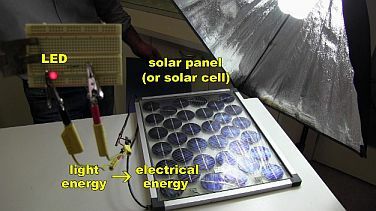 Covering the solar panel reduces the amount of light hitting it, and so there’s a corresponding drop in the electricity being produced. If the panel was outside in the sun, more electricity would be produced. 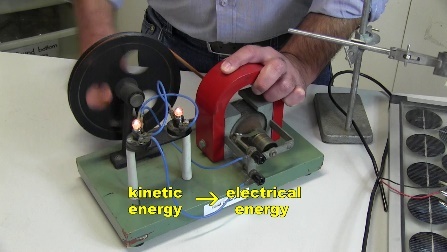 A generator on the other hand transforms kinetic energy into electrical energy. 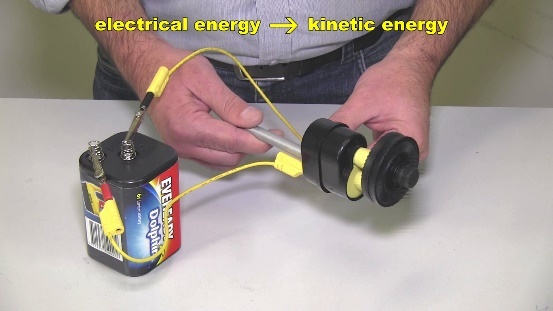 As the coil of wire spins near the magnet, some of its kinetic energy is being transformed into electrical energy. 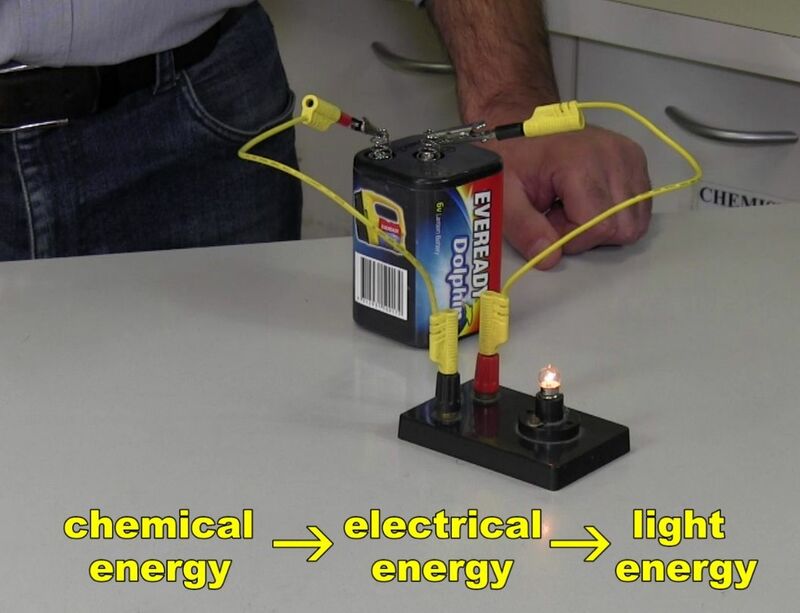 The electrical energy being produced by the generator is then transformed into light energy by the light globes. Energy is constantly being transformed from one form to another by different things. These wind turbines transform the kinetic energy of the wind into electrical energy. Inside the housing is a generator very similar to the one we’ve just looked at. Cars also have generators (called alternators), which, as they spin, convert kinetic energy into electrical energy. The electrical energy continuously recharges the car’s battery. You can just see the copper wires inside this alternator. 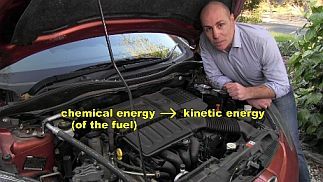 The car’s engine transforms the chemical energy of the fuel that it burns into kinetic energy. This is a simplified diagram of a typical engine. We have a piston that moves up and down in the cylinder, some valves which let gases and the fuel in and out at the right time, and a spark plug that ignites the fuel. Here we can see a mechanic removing what’s called the head of an engine. The head holds all the valves and the spark plugs in place. With the head removed, we can see the tops of the pistons inside the cylinders. Here is a piston that has been removed from another engine. As I said the piston moves up and down in the cylinder. Fuel and air are drawn into the cylinder of the engine through the inlet valve as the piston moves downwards. 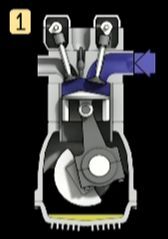 The valve then closes and the fuel-air mixture is compressed as the piston rises. A spark, generated by a spark plug, then ignites the fuel. This generates heat which causes the gases that are produced in the chemical reaction to gain kinetic energy and to expand. These expanding gases push the piston downwards. Finally, the exhaust valve opens and the gases are pushed out by the rising piston. They exit via the exhaust manifold and the exhaust pipe. Electric cars use electric motors to propel themselves. Electric motors convert electrical energy into kinetic energy. Now as I said earlier, energy doesn’t just transform from one form to another, it also transfers from one object to another. Wind has kinetic energy and can push on the sails of a boat to give the boat kinetic energy as well. Some of the wind’s kinetic energy transfers to the boat. 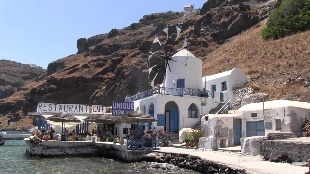 It’s the same with this old wind mill and with wind turbines. 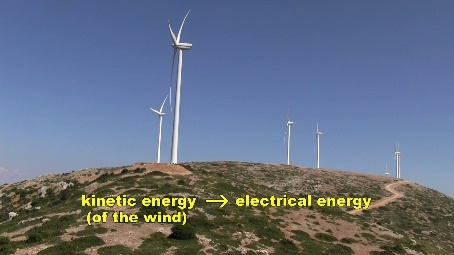 Some of the kinetic energy of the wind is transferred to the blades of the turbine and so they gain kinetic energy when the wind blows. So in summary, energy comes in different forms, including kinetic, chemical, light, electrical, heat, sound, elastic potential, gravitational potential, and nuclear. Energy can transfer from one object to another and it can transform from one form to another. Energy can also be measured. 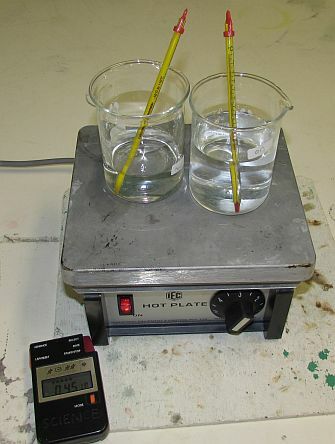 Just as we can measure, for example, the volume of a liquid in litres, we can also measure energy in Joules. The joule, which has the symbol J, is the unit for all forms of energy. For example, this apple has about 300,000 Joules of chemical energy stored in it. 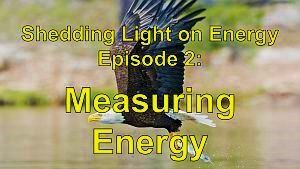 We’ll be taking a closer look at actually measuring energy, in Joules, in our next episode. See you then. Stroboscopy: Normal Female Vocal Cords by James Thomas is licensed under a Creative Commons License. 4StrokeEngine Ortho 3D.gif by Zephyris is licensed under the Creative Commons Attribution-Share Alike 3.0 Unported Licence. Thank you to the people of Rizoma, Trikalon, Greece. Thank you to Cheltenham Secondary College, Victoria, Australia. It’s buy two, get one free!